The ‘Buy it Now’ button loomed large, but the sale price was a little too fat for my liking, sure I wanted this Honda Novio even though I faced a long trip to Somerset to collect. The seconds ticked down, and I wasn’t upset to see it go through unsold, hopeful it would return at a lower price. A few weeks later we left home at six am and headed west, arriving in the middle of nowhere four hours later; and yes, it was as described. 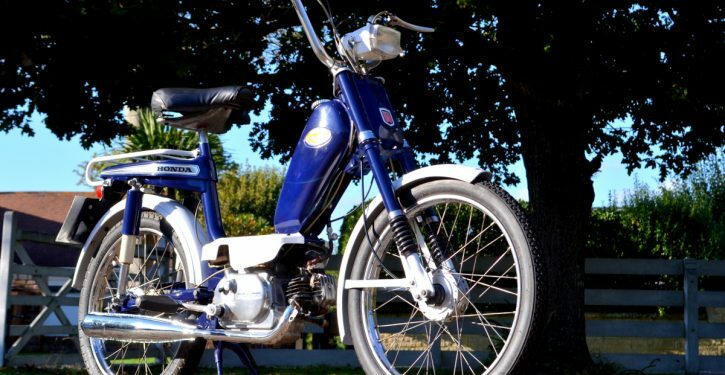 The seller explained this Honda moped belonged to his son who had long since flown the nest leaving his toys in the garage for years. A quick sniff of the petrol cap convinced me this bike hadn’t run in a long time, maybe a decade as any juice had either gone off or turned to jelly. Within an hour it was strapped in the back of her car (well I didn’t want to mess up mine) and we headed back, pleased with our purchase. The Honda PF50 Novio is one version of the P range which include the earlier PC and the sporty 3-speed PS, plus the Amigo and Graduate; all basically the same with alterations for different markets. 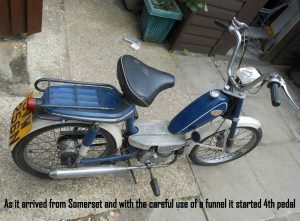 These were proper mopeds, minus kick start or gears and complete with pedals running 6 volts with magneto (no battery). Initially all four strokes, except for the Amigo 2, the oil burning version which came later and in smaller numbers. 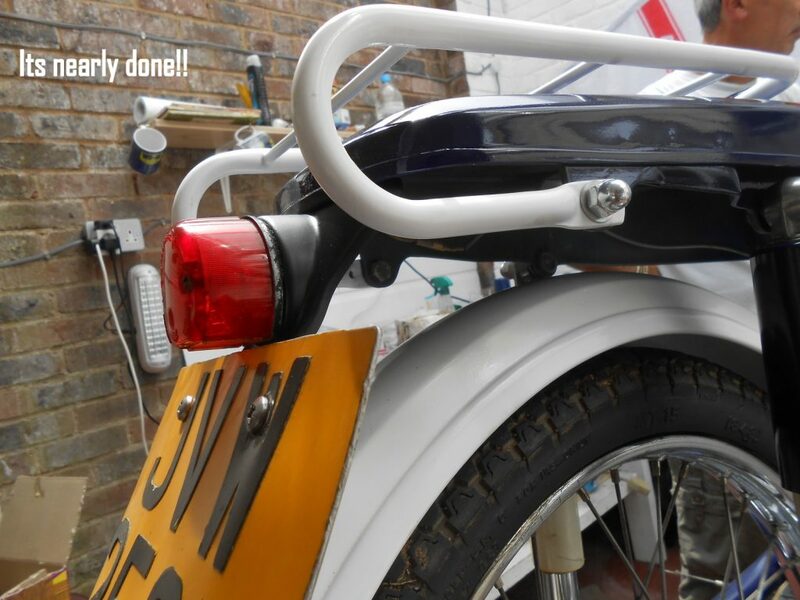 The Novio varied from the others with its fuel tank moved from the rear position above the rear mudguard to the more conventional place attached to the frame. This bike was assembled in Belgium for the home market or exported across Europe including the UK, and mine a 1975 enjoyed 9 previous owners and plenty of surface rust. In the UK we got a choice of Red, blue or yellow, but it seems many orange versions also found their way across the Channel. 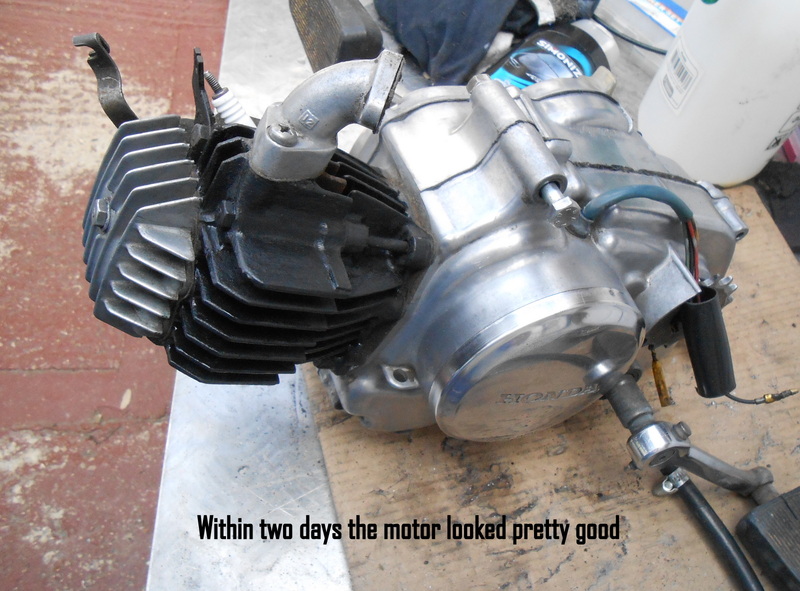 Packing 1.8hp Honda’s 49cc unit is fantastically reliable and long lasting, similar to the C50 or ST70 type motors, well maintained they should last forever. A ‘Peddle & Pop’ that can reach 30mph on the flat, they don’t like hills especially with my 15-stone bulk attached but enjoy adequate brakes and plenty of smiles per mile. My Purchase – Pup or Pedigree? 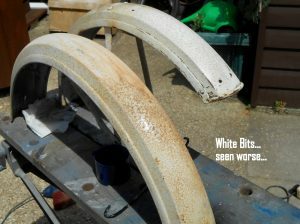 First bonus, the rims were rust free as this can kill any chance of your moped resto coming in on budget. The tyres held air and she was solid, all surface corrosion, no real rot in the frame. Second bonus, the fuel tap had either been left on or leaked, the consequence being the tank was gunge free; so clean in fact half a pint of fresh juice and twenty minutes fettling resulted in a blast round the garden. The exhaust was rotten, and a mouse had eaten the air filter, so before my juvenile behaviour damaged something costly the strip down would take place. 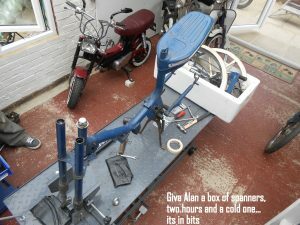 For this my trusty pal Alan is offered a selection of metric spanners and half a day to complete the task; as usual by beer o’clock the machine is a large pile of parts. 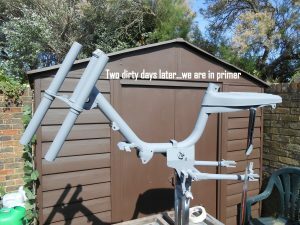 The motor was encased in West Country mud whilst the paint finish offered the ‘shabby chic’ look, well more shabby really, whilst its white bits enjoyed the yellow splattering’s of surface rust; nothing we hadn’t seen before. I took on the frame first and I won’t bore you with the details except to say I ran out of Black & Decker sanding sheets just in time to admire a paint free vision. 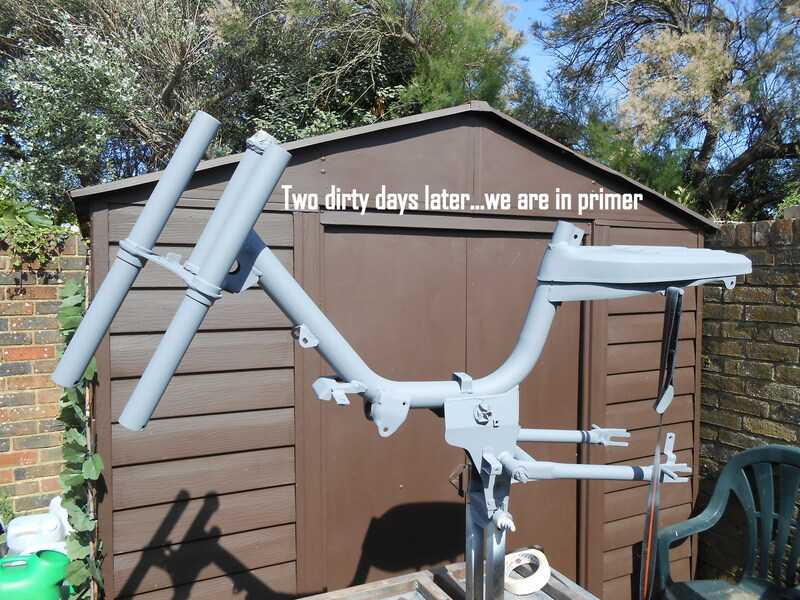 Minor corrosion around the centre stand required a light fill, and a litre of primer later ensured the frame was ready for paint in two days. 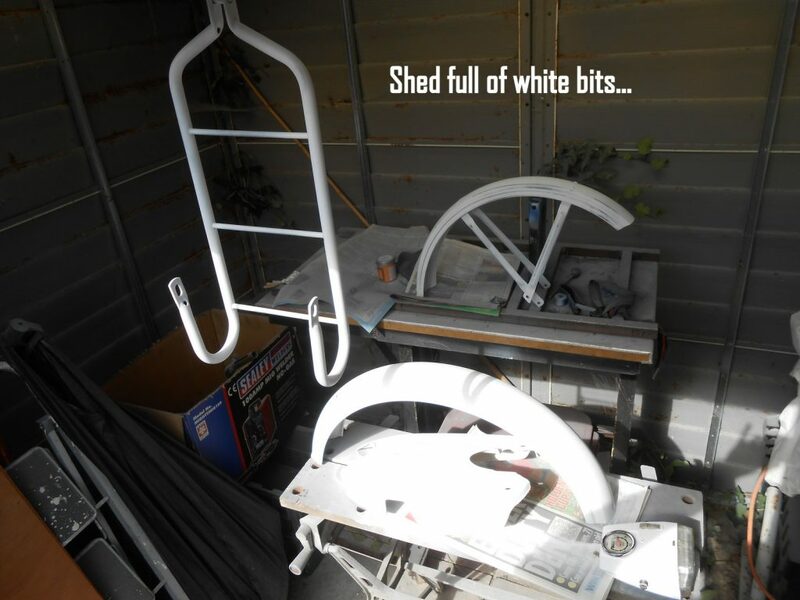 The white bits included the rear rack, both mudguards and footrest, the place Spanish kids used to rest their flip flops on whilst riding around the Costa Plenty. Having de-scummed the motor, another day flatting back the stained alloy covers paid big dividends and once the barrel was covered in engine black this engine looked a treat. ‘On a roll’ I went straight onto the white bits whilst Alan returned to reconnect the frame and engine. The pitting at the base of the forks wasn’t going to be acceptable so they were filled and painted in the same white and the top yoke enjoyed similar care before sliding back together with the tubes and new gaiters. Rear light removed from number plate bracket, a trip to the blasters, then three coats of satin black whilst the headlight needed special treatment. Stripped down with care as replacements aren’t ‘two a penny’ and some clever use of epoxy saved the lens as that had cracked at the mounting point. Mopedland supplied a service kit including the sock type air filter, and Alan changed the oil, reset the timing with new points and greased everything before refitting the freshly polished rims. Any bolt that excepted a new chrome domed nut got one, it’s the small details that make all the difference and that also goes for the graphics. These are not available in the UK but by the power of Ebay I found ‘hielorojo’ who supplied the finest front and rear decals for around £30; exact fit and great quality direct from Spain. We messed about with a replacement seat but eventually resurrected the original and Alan took the glory job, attaching a shiny new exhaust. 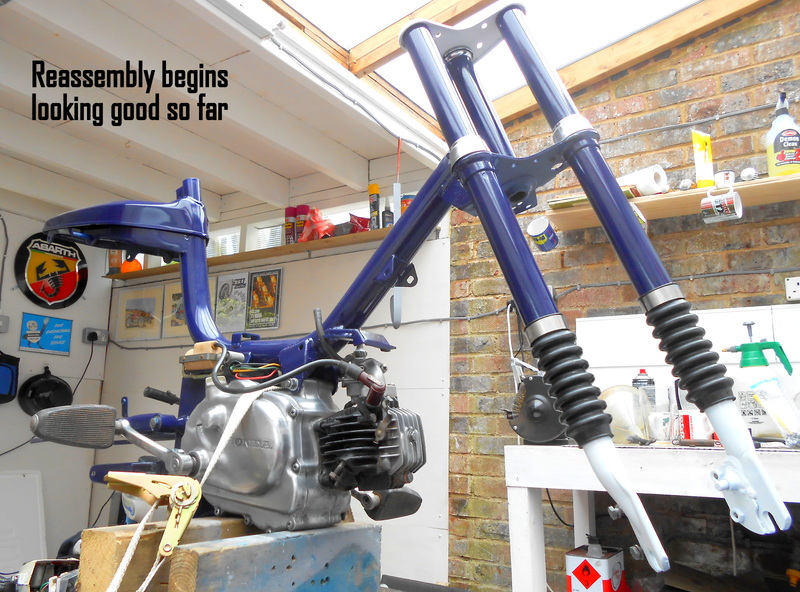 Once the fuel tank had dried and received a new cap, the final piece of the Novio jigsaw was very gently attached; fresh juice and two pedals later she ran perfectly. Whilst I would like to boast of the great challenges we took on and defeated, this Honda was by far the easiest and most enjoyable ‘Ped Rescue’ we have undertaken. We bought a solid machine that gave us few issues and with the service completed and carb fettled Alan has managed to secure more horses from the old girl. It sits at 30mph quite happily and even with my beer induced bulk aboard will hit 40 down a steep hill; but it’s the acceleration that impresses most. She looks a treat for her 43 years, handles well and always attracts interest; a rare beast on the UKs roads the Novio is a pleasure to have around and is certainly a keeper. Around here we don’t take too much time to enjoy the spoils as it’s straight onto the next and this coming winter we have a queue of ‘dead peds in my shed’.